This year our trip was a 17 day tour of Thailand, Vietnam, Cambodia & Laos. We arrived in Bangkok on 24 April around Mid-day. Boonlert, our Bangkok agent, was at the airport to welcome us & transfer us to our first hotel, the Amari Watergate. This is a very classy 4* hotel located at the very centre of the city within easy access to the main shopping district & markets of Bangkok. The huge lobby is elegant & spacious with a lovely display of flowers. The room was quite large with elegantly designed with Thai artefacts. The luxurious marble bathroom was a joy to relax in. We decided to use this hotel as our superior class hotel in Bangkok. But as this trip is not just for pleasure, there's work to be done and we set off this afternoon on an inspection trip of hotels in Bangkok. The Montien hotel, in a good location at the heart of the city’s vibrant commercial & entertainment areas, proved to have friendly staff & a lovely conservatory style lobby with plants & trees, and we chose it as our standard class hotel in Bangkok. The Royal Orchid Sheraton features an elegant lobby full of Thai decorative arts. All the rooms of this 5* deluxe hotel have river views, and there are two beautiful swimming pools set in delightful tropical gardens. We will use the Sheraton as our deluxe class hotel in Bangkok. Now we head back to the city for The Landmark hotel. 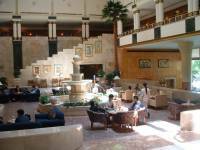 This 4-5* hotel is well located with easy access to all shops & Skytrain systems. The more we walk in the more impressed we are with this hotel. We will be using Landmark as both our superior & deluxe class Bangkok city hotel. Thanks to the sales manager of the Landmark, Mr. Lekhaka, who offered us a lovely buffet dinner at the hotel restaurant (one of no less than 10 restaurants at the Landmark!). The display & choice of food is beautiful & extensive. The best was the seafood hot plate with prawns, lobster etc prepared by the chef while you watch. It was delicious. Next day we flew to Ho Chi Minh City. I still feel the excitement every time I come back to this city once called Saigon. Our tour guide, Hieu, was there to greet us. Hieu has been highly praised by most of our clients, and it is easy to see why. He has an enthusiasm about his country and life in general which is infectious. We check in the new 5* deluxe Legend hotel. Its stands imposingly facing the scenic Saigon River, within walking distance of the famous Ton Duc Thang street. The vast & bright lobby has steps down to the coffee area, with further steps down to the restaurant below with an open view of the garden & swimming pool beyond the glass doors & windows. The décor is modern in a combination of western & eastern styles. 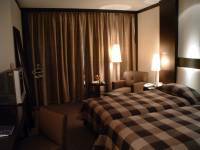 The room is large & comfortable in elegant style. The Vietnamese restaurant in the garden was lovely & quiet for our evening meal provided courtesy of the resident manager, Mr. Ikeno. The food was good, especially the egg pancake & spring roll starter and the Vietnamese culture music & dance performance on stage was entertaining. 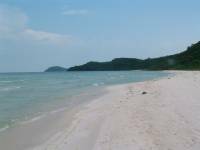 Next morning we flew to Phu Quoc Island, an isolated island stranded just off the Southern coast of Cambodia in the Gulf of Thailand. It has the sea, sandy beaches, fishing villages & forests making it an ideal location for many Vietnamese visitors from the mainland. The most attractive side of this island is that it is still unspoilt & little developed for tourism, but as a result accommodation & facilities are limited. The best hotel on the island is the Saigon Phu Quoc Resort. 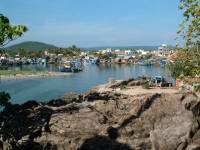 The road from the airport ended just beyond the Phu Quoc Resort. After that it's red dirt road all the way to the Southern end of the island. Unlike Saigon, the traffic here is sparse, just an occasional bike, car or lorry on the road. We rode motorbikes during our stay on this island, and felt free & relaxed in this natural unspoilt environment. 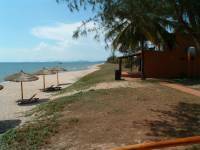 The Phu Quoc Resort is ideally located on the beach front, with room & bungalow accommodation. 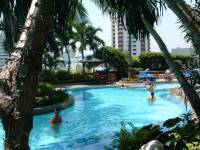 The swimming pool is large & beautifully situated below the balcony of the restaurant. A few steps down will lead you to the sandy beach. There is a hotel beach bar with the best view of the sunset in the evening, drinking your beer or cocktail on a wooden chair on the sand. A very romantic setting for many couples staying at the resort. We found ourselves drinking our Saigon beer at nightfall on the beach bar facing the dark horizon. The sound of the waves reminds us that the sea only a few feet away from our chair. We sat quietly for hours drinking beer under the moonlight. Lunch is included at the resort - spring rolls, fish, vegetable & rice - but for dinner we went to the delightful local restaurant, Gop Gio, within walking distance of the Phu Quoc Resort. The food & the atmosphere of this restaurant are very memorable. This restaurant was recommend by Hieu who was travelling with us as a guide. It’s all credit to him. He proudly announced that this is the best restaurant on the island and he was not wrong. The grilled shrimp (large prawn) in garlic was out of this world. Deep fried fish with fish sauce was unbeatable, while the simple stir-fried mixed vegetables was pure delight. We were so happy with the food we went back on our second night on the island. This time we had deep fried prawn that was equally good. Stuffed squid was beautiful, steam fish was so fresh & tasty, the vegetable dishes such as water morning glory in garlic was a joy. Because we were visitors the restaurant staff insisted that we stayed in the VIP room with air-conditioning & fan. The local people sit in the open restaurant. During our second visit we ate under a hurricane lamp because of a power cut. The chef was also cooking our meal in semi-darkness but the result was as good. Because of the power cut the two girl members of staffs stood behind us to cool us down with a hand fan. The sound & noise of the local people enjoying their food & beer plus the food & atmosphere of the restaurant make this the most memorable restaurant of our whole trip. Next morning Hieu brought along two locals lads with their motorbikes to take us for the day snorkelling among the An Thoi islands. The hours journey on the back of the motorbikes along the coast was very pleasant. The view of the sea was never far away & the rural countryside of trees & green hills on the other side until reaching the fishing village of An Thoi. The fish market & the harbour reminded me of Phan Thiet. We joined a small group on a local fishing boat for the snorkelling trip, and we all set sail south to a group of small islands, stopping for fishing & snorkelling. Although there are not many colourful fish, the beautiful corals are worth seeing. Lunch was cooked on board with fried fish fillet and rice plus the fish caught earlier by the boatmen and guests. Fish soup & vegetable dishes were also included. After an hour or so rest we set sail to another island for more coral snorkelling. The sun was hot, the sea was warm, the coral underneath was beautiful & I was enjoying it. On our second day we were motor biking into the national park through Mt. Chop Chai, Mt. Chua down to the eastern side of the island all the way to the remote area of Sao Beach. This southeast area of the island has the best white sandy beach & crystal clear water. The dirt track to get to Sao Beach is difficult so not many tourists go there except the Vietnamese. You can spend a day swimming & relaxing while there is a local restaurant serving food & drink on the beach in simple local style. I hope no one will build a hotel on this spot & spoil it all. I was quite reluctant to leave Phu Quoc Island. 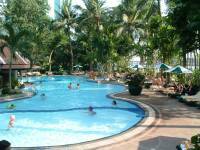 We returned to Ho Chi Minh City & checked in at the 3* Kim Do hotel. We are using this centrally located city hotel for many of our clients & I was satisfied that we will continue to use it as our standard class hotel in Ho Chi Minh City. For our last night in Ho Chi Minh City, my agent, Luan & Hieu took us out to a local restaurant called No. 13. We drank Saigon beer & Da Lat wine and ate spring rolls & stewed catfish in fish sauce - it was my happiest moment in Saigon.